Making your own bread can be infinitely satisfying and I’ve been doing it since I was a teenager. I’ve not been hugely creative and tend to stick to tried and tested recipes. At least I did until I got my KitchenAid earlier this year. I’d never used a mixer to make bread before, so it seemed like a good time to do something different. This malted wholemeal and rye loaf was a good start. I’ve been making rye sourdough for the last six years. It’s easy and doesn’t require kneading; it fits in well with a busy lifestyle and a rather cluttered counter top. But it’s nice to ring the changes. I do this by making a no-knead bread in this rather excellent silicone bread maker. However the KitchenAid has allowed me to make something different again – breads that require kneading. 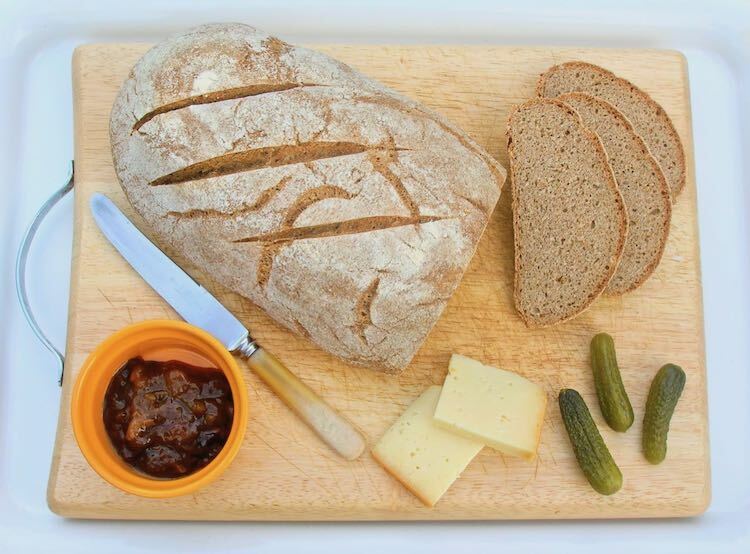 My first venture was this malted wholemeal and rye loaf that I made up on the spot. It worked so well, I’ve made it several times since, both with dried and fresh yeast. Latterly, I’ve been adding linseeds to the mix for added texture and nutrition. This malted wholemeal and rye bread is a substantial loaf, but it’s less dense than my rye sourdough. I used a mix of strong wholemeal, rye and oak smoked malted flours, all stoneground and organic. Forget these if you are looking for a light and airy loaf though. The bread is utterly delicious with a malty undertone and subtle smokey notes. It makes fantastic toast, but is also good just as it is with Cornish Gouda and homemade chutney. 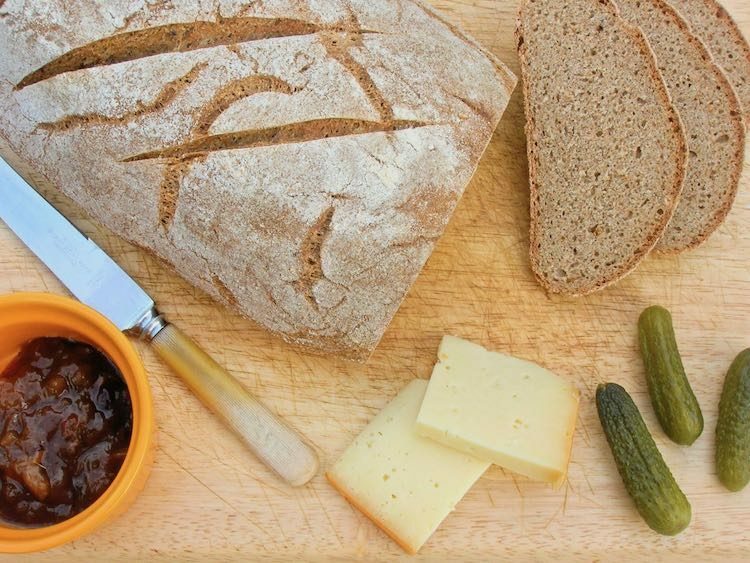 A substantial wholesome loaf, which is easy to make and quite delicious with malty smoky notes. Makes great toast. Mix the yeast, honey and water together until the yeast has dissolved. If kneading by hand, place flours, salt and linseed, if using, into a large bowl, make a well in the centre and gradually add the yeast mixture stirring as you go until the mixture comes together to form a dough. Knead for a good ten minutes. Otherwise, throw everything into the bowl of an electric mixer and using the dough hook knead on a low setting for ten minutes. Turn out of the basket onto a baking tray and slash the top with a knife two or three times. Bake at 220℃ for 20 minutes, then turn the oven down to 200℃ and bake for another 20 minutes or until the bottom of the loaf sounds hollow when tapped. Vegans can substitute malt extract for honey. The longer the rise, the more digestible the bread will be. It will rise very quickly in a warm environment and much slower in a cool one. I’m sending a slice of my malted wholemeal and rye loaf to Jen’s Food where you will find this month’s Bready Steady Go which is co-hosted by Michele over at Utterly Scrummy Food for Families. Jen also has the pleasure of receiving this for Bake of the Week which, in Helen’s absence, she is hosting over at Jen’s Food. Thanks for visiting Tin and Thyme. 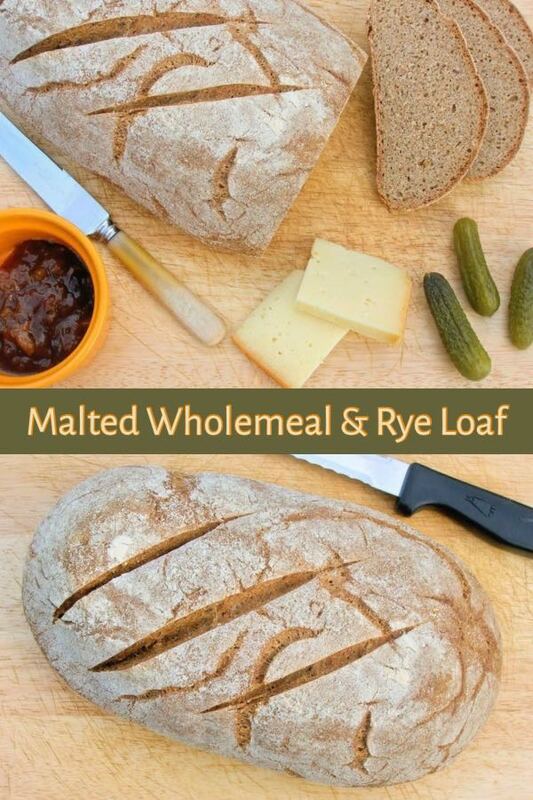 If you make this malted wholemeal and rye loaf, I’d love to hear about it in the comments below or via social media. Do share a photo on social media too and use the hashtag #tinandthyme, so I can spot it. For more delicious and nutritious recipes, follow me on Twitter, Facebook, Instagram or Pinterest. Malted Wholemeal and Rye Loaf. PIN IT. Thank you Sammie. Homemade bread and scones on holiday sounds perfect. I bet the family appreciate it. Hope you’re having a fab holiday. Using the bread machine to mix and prove only seems to be the preferred method for everyone I know who has one. this looks so good and as you know I made almost exactly the same loaf this weekend… I love this loaf and i’ve only really just started baking with rye flour and i’m really loving the texture. It tastes amazing toasted too which is always a bonus for me as I love toast! Rye flour is a wonder Dom and it works surprisingly well in cakes too. Your bread always looks fantastic, but it is fun experimenting with different flours and recipes as you never know when your next favourite will pop up. Not sure how this fits into CCM as the flours used are not cheap, but I did mean to link my previous recipe up, so will try not to forget again. That looks wonderful Choclette. I have more and more been thinking about bread making again. I do miss it and need to make time for it. Just need to replace my oven that conked out this week first. Thanks for linking to me. Looks a beautiful texture – I think some good cheese and tomatoes and I’d be very happy! Thank CC, glad you like the look of it. I was a little disappointed you didn’t see the Black Forest Gateau I posted earlier in the week – it had to be done! A lovely artisan bread. Choclette. p.s did you use malt or or malted flour? Didn’t see it mention on the list of ingredients. And what kind of rye did you use? Hi Angie. So glad someone reads my recipes and picks up mistakes. Thanks for drawing this to my attention. All flours are organic wholemeal stoneground and the malted one was an oak smoked malted flour. Totally agree, making bread is a pleasure. Even better is the pleasure of eating it – my husband has become the breadmaker in our house, most of our sourdoughs are white but we did one with an ancient type of wheat, not spelt, I forget the name. Dense and rich. Need to experiment further with more types of flour. Well I have to agree with you there Kavey. If delicious healthy home baked bread just happened to turn up, I might not be that sad to only be eating it. Ahhh, no bread GG? I’d find it very hard to go for more than a couple of days without it. And yes, this sort of bread would be great with Scandi food. This sounds amazing and how unusual with the smoked malted flour! Bread making is one skill I wish I was better at, so will have to go out and find the ingredients for this and give it a go! Wholemeal breads are usually a lot more forgiving than white bread I find, so it’s not a bad one to start with Lisa. Looks fabulous. I really must start reading FB requests properly and not post up things that are not relevant, doh! I recently bought a dough hook for my elderly Kenwood Chef and am also impressed with the results, better than the bread machine in my opinion. Ah no worries Janice, sorry for not being more specific. I have a real soft spot for the Kenwood. My mother still has hers going back to the year dot. Look forward to seeing what you and your dough hook come up with. I have just had to give up bread, and this is torture. Rye bread is my absolute favourite. Ah no Dannii. Have you developed gluten intolerance? Thanks Kath. Expect I will get stuck in a rut with this one now! Though I have also made a sourdough with the same mix of flours which worked really well too. There is nothing in this world as good as fresh bread right out of the oven! This looks and sounds soooo good too! Thank you Chris, I think I have to agree with you. And the smell wafting from the oven as it is cooking is pretty dreamy too. Make something simple and stick to it until you’re happy with it Brian. It’s worth persevering – honestly. Wholemeal flours are actually much easier to work with than white ones. Recipe looks healthy and very easy.. Will try it..
I’m all for simple recipes Sundari – life is busy enough. I’ve made bread at home quite a few times and it has been a time consuming method but I really liked your recipe considering it’s doesn’t require kneading! Shall be trying it for sure. Ah Madiha, this one does require kneading, although I have a no-knead recipe on my blog. I used a machine to do the kneading for this one. Oooh oak smoked malted rye! That sounds amazing, and your loaf looks so incredibly delicious! 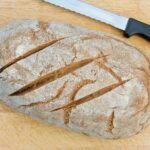 Oh don’t be scared by yeast, simple bread is really easy to make and wholemeal flours are a lot more forgiving than white. I love the taste of Rye and this loaf looks so delicious Choclette! I love malty notes Jen, although using malted flour is a bit of a departure for me too on the bread front. I tend to use Bachaldre Mill flours – they have a good range and are all organic and stone ground. Typically white flour has a shelf life from milling of 12 months. Wholemeal flour will be good for 6 months. Thanks for that information Ryan. I guess it makes sense that the more highly processed flour will last longer.